Gary Rome Hyundai Dealer Blog - A Gary Rome Hyundai Site (888) 637-4279: Hyundai Ioniq: most important car at the Geneva Motor Show? The Geneva Motor Show is stuffed with cars, both European volume cars we don't see in North America and a huge number of pricey and high-performance supercars and customs. So despite the fact that it was a global debut, the 2017 Hyundai Ioniq didn't seem to get the buzz it might have if it had been launched in, say, Los Angeles. The high-tailed hatchback appeared in all three forms in which it'll be sold: hybrid, electric, and plug-in hybrid. It was one of the few launches of a volume car that will be sold worldwide, and it's certainly the most important green car at the show--but it may be the most important, period. 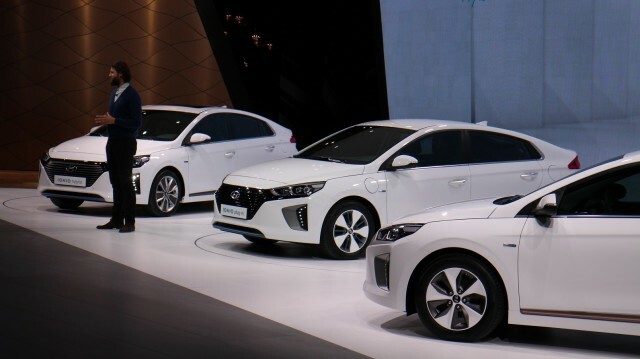 That's because the Ioniq is the first car in the world to be produced with a choice of three different powertrains, from fuel-efficient gasoline hybrid to battery-electric. The concept of such an offering was previewed back in 1999 by the General Motors Triax concept--which offered both internal-combustion and all-electric powerplants--but no one's put it into production until now. Europeans still don't give Hyundai and Kia as much credence as they get in America for having vehicles that can now compete head-to-head with the most popular Japanese and U.S. models. But cars like the Ioniq will be very important as every carmakers struggles to meet corporate average fuel economy rules through 2025, as well as California's zero-emission vehicle sales requirements, which start to climb steeply in 2018. The European Union has even more aggressive targets for reducing carbon-emission levels from vehicles, and China's are somewhere in between those and North America's. But unlike the European makers, Hyundai and Kia have never been particularly invested in diesel powertrains--meaning they will see little fallout from the current Volkswagen diesel emission scandal that's shaking up the industry. German makers are finally conceding that electric and plug-in hybrid vehicles will play a big role. Last night, VW Group CEO Matthias Müller said it outright: "The car of the future ... is electric." 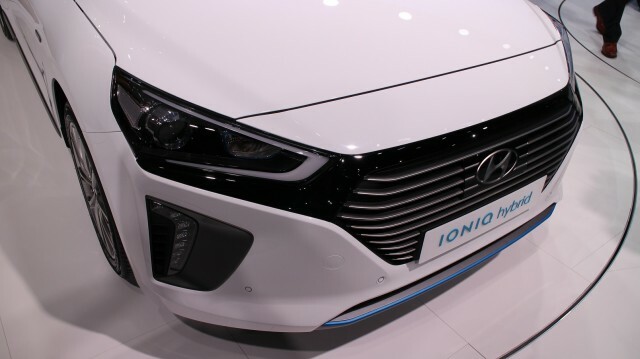 So what do we know about the Ioniq range now that we didn't know before its introduction? After seeing all three models--the Ioniq Hybrid, Ioniq Plug-In, and Ioniq Electric--"in the flesh" and sitting in them briefly, we've collated a handful of notes. The 2017 Hyundai Ioniq is not as large as a Toyota Prius, inside or out. But its styling works better in person than it may in photos. The interior trim is relatively plain, and it's clearly a lightweight car, with a somewhat tinny sound when a rear door slams. All three versions appear to share the same sheet metal, though the electric has a noticeably different front end, with a blanked-out silver grille. Under the hood, the Ioniq Electric has a plastic cover over its power electronics that you might mistake for an engine shroud--but the 12-Volt battery sitting front and center indicates something's awry with that assumption. The load bay for the electric model, with its under-floor battery pack, is shallower than that of the Ioniq Hybrid, but not punishingly so. Importantly, Hyundai stresses that all Ioniq models will have "dynamic ride and handling characteristics,"
The idea is that all car buyers want a good experience and a pleasant vehicle, and even if they prioritize fuel efficiency or electric power, they aren't willing to pay a penalty in performance or appearance. Contrast that to four generations of Toyota Prius, which were distinctive but not much fun to drive until the current 2016 model hit the streets--and the styling of that latest generation is still very much an acquired taste. While Hyundai's designs five years ago were bold and noticeable--and helped boost its sales--the company has lately grown more conservative in its designs just as Toyota has gotten considerably more expressive. That may help the Ioniq be perceived as a more efficient "normal" choice of small car, rather than a polarizing choice like the Prius hybrid, the Nissan Leaf electric car, or to some extent, the first-generation Chevy Volt. It'll all depend on what the cars are actually like to drive, however, and we'll likely have to wait six to nine months for even the 2017 Hyundai Ioniq Hybrid to be offered to journalists for review before it goes on sale late this year or early next year. The car's EPA ratings will also be key; Hyundai hopes to get a 50-mpg fuel-efficiency rating for the hybrid, but it remains to be seen whether the Ioniq Electric's 28-kilowatt-hour lithium-ion battery pack can give much beyond 100 to 115 miles of range. Its quoted range in European media materials is 155 miles, presumably on either the European or Korean test cycle. Still, Hyundai is a very aggressive company, and the rest of the industry views it as a formidable and dangerous competitor, given the lengths it has come and the improvements in each generation of cars it has offered. It has said that together with Kia, it intends to be the second-largest seller of green cars in the world by 2020. It will still be behind Toyota, which by then should have hybrid versions of pretty much every vehicle it offers, but it means Hyundai-Kia expects to sell more hybrids, plug-in hybrids, and battery-electric cars than General Motors or Nissan, to name two current leaders in those fields. One way to do that is to spread the costs over as many vehicles as possible. Along with the Kia Niro (only a hybrid today, but likely have future versions with plug-in hybrid and battery-electric powertrains), that's why we think the Ioniq may be the most important car at the Geneva Motor Show. Even if European journalists largely failed to notice.